Nan Crouter, chair of the Presidential Search and Screen Committee, addressed Alumni Council on Friday. 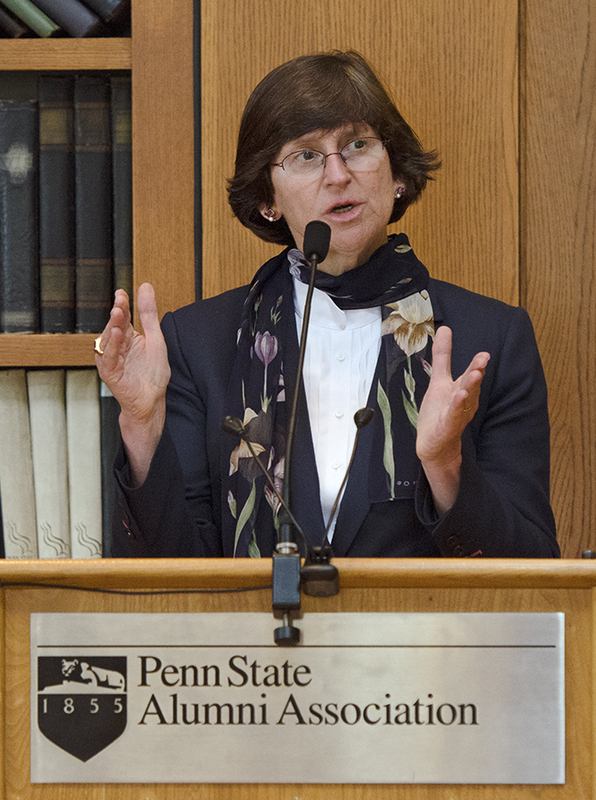 Toward the end of Friday’s Alumni Council meeting, members heard an update from Nan Crouter, chair of the Presidential Search and Screen Committee, which has begun identifying potential candidates to be Penn State’s next president. This is not an opportunity that’s going to come along very often. The process involves two committees. Crouter leads the Search and Screen Committee, which includes administrators, faculty, students, and alumni, and which is charged with identifying a short list of candidates. That list then goes to the Board of Trustees’ Presidential Selection Council, which is chaired by Karen Bretherick Peetz ’77 and includes 12 trustees and Peter Tombros ’64, ’68g, chair of the current capital campaign. The latter committee will choose the president. Crouter was asked about the two-committee system; the questioner was concerned about the possibility for confusion or conflict. She explained that the system had been used in previous presidential searches, and she added that the two committees have already met together. She said that four trustees will attend meetings of the search and screen committee, and that four members of the search and screen committee will attend meetings of the trustees committee. She was one of three officials to speak with Alumni Council on Friday; president Rod Erickson and Board of Trustees chair Keith Masser ’73 also addressed the group. Each person spoke for about 10 minutes and took questions for another 10. 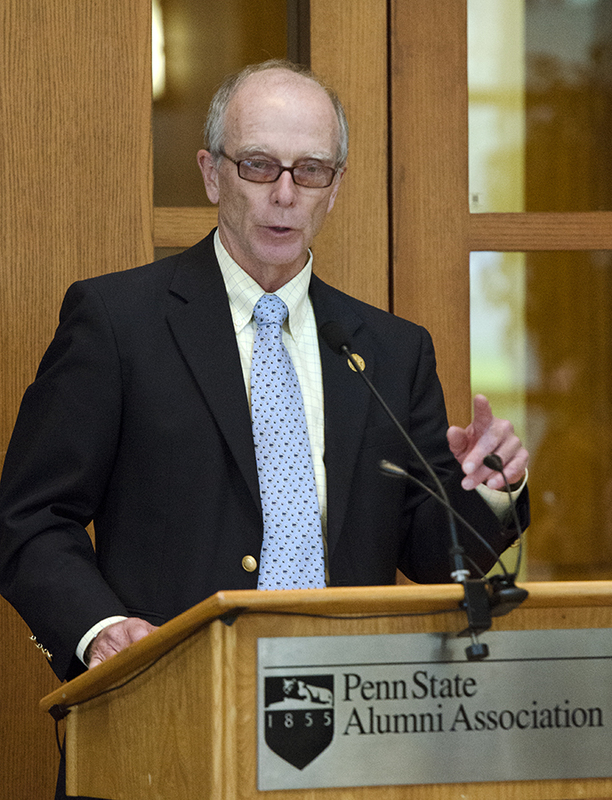 Board of Trustees chair Keith Masser answered questions from Alumni Council. Among the items: removing the governor and president as voting members, increasing the quorum to a simple majority, term limits for trustees, a longer waiting period before trustees can become university employees and vice versa, and provisions for removing a trustee because of a conflict of interest or other conduct. The last point prompted a question from council member Liz Bligan ’91, ’98g, who asked Masser about the perception that the final two proposed changes were designed to prevent specific people from joining the board or from staying on the board. She didn’t use their names, but she was referring to Jay Paterno ’91 and current trustee Anthony Lubrano ’82. Erickson did agree to a minimal tuition increase. That amount won’t be settled upon until the July Board of Trustees meeting. —Erickson said his biggest concern is the prospect of budget cuts mandated by the federal sequestration. The full effects aren’t yet being seen, but Erickson said the best guess is that the university will lose between $40 and $50 million in federal research funding. Additional effects: lower Medicare and Medicaid reimbursements at Hershey Medical Center and cuts in student aid, particularly work-study programs. Entry filed under: Board of Trustees. Tags: Alumni Council, Keith Masser, Nan Crouter, presidential search. Will the proposed policy on conflicts of interest be made public before the May 3 meeting? It was not included in the draft discussed at March meeting.